A running prototype of Microsoft’s Xbox Watch that was produced in 2013 for a planned release for consumers in 2015 but eventually got pulled out of the wearables market has resurfaced online. 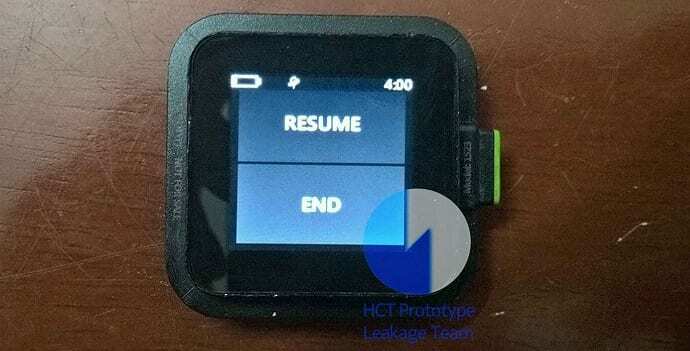 Thanks to Twitter user, Hikari Calyx, who published the images of running unit of Microsoft’s Xbox-branded smartwatch (spotted by Windows Central) show that the device supported four basic apps at that point in time: ‘Workout,’ ‘GPS,’ ‘Settings’ and a USB debugger meant for developers. Designed by part of the Xbox hardware team, the cancelled Xbox Watch had a square 1.5-inch color display and was set to feature a heart rate monitor and a battery life of two days. However, there seems to be no charger been ever made for the Xbox. “If you find the Xbox Watch can’t be recharged, you can disassemble the screen with a utility knife or a razor, then hit the positive pole on the battery with piezoelectric ceramic igniter from a lighter”, Hikari Calyx tweeted. The smartwatch had the Xbox logo on the back and the interface uses the rectangular tiles like the familiar ones on Xbox devices. The rumors suggest the Xbox Watch could have featured a design with the ability to be customized through replaceable bands. Rumors also suggest that the device was to have gaming features and LTE connectivity. While it’s unclear how far Microsoft went into the development of this device, but with the first and second model of fitness bands being a failure, Microsoft certainly seems to have no plans to make such a device in the near future.